Before fall creeps in, we are going to continue basking in the beautiful flowers that summer brings. 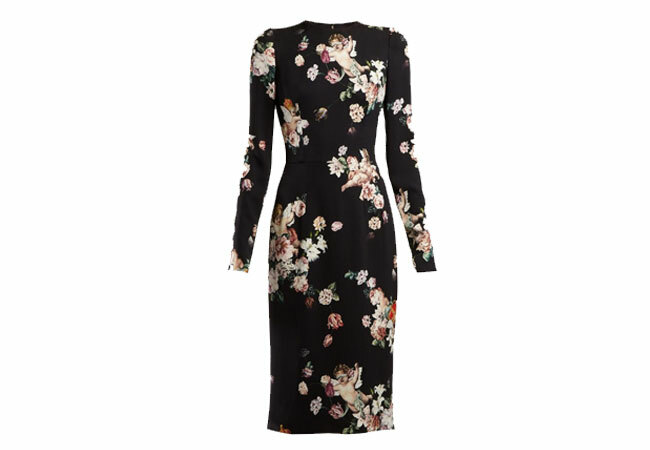 Dolce & Gabbana's Autumn/Winter 2018 collection takes inspiration from religious imagery, as seen in the mural style cherubic angels printed across this stunning floral black midi dress. It's shaped with a round neck, long sleeves and a neatly fitted waistline, then falls in a pencil silhouette to just below the knee. To compliment the pretty shades of white and blush, we opted for accessories that injected a tad more color to our look. Saint Laurent's 'Amy' sandals breaks all the 'no white after Labor Day' rule. This versatile pearl hued design is finished in glossy patent leather and works a knotted, crisscrossing element over the toes and slender wraparound ankle straps. Next, we wanted the bag to make a statement without stealing the show. 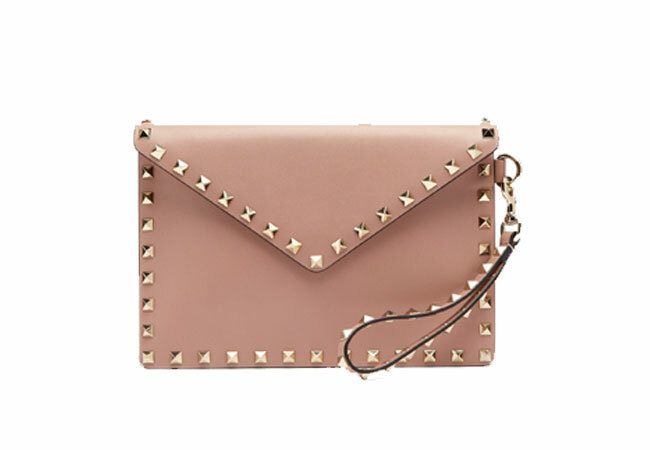 Carry this dusty-pink Valentino Rockstud clutch as an emblem of the house’s rich history and excellent workmanship. Made in Italy from leather, this sleek design is dotted with pale gold-tone metal pyramid studs along the edges and on the detachable wristlet strap. 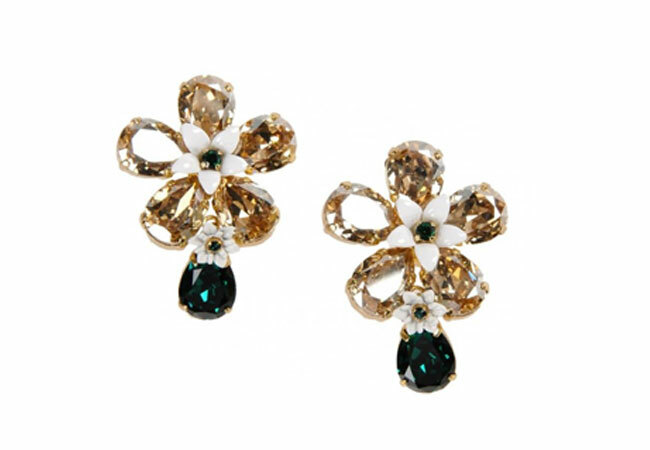 For a touch of sparkle Dolce & Gabbana's crystal and emerald stud earrings lends even more flower power to this blooming ensemble. The beauty look for this outfit is all about blush; flushed cheeks can make you instantly look more healthy and awake. 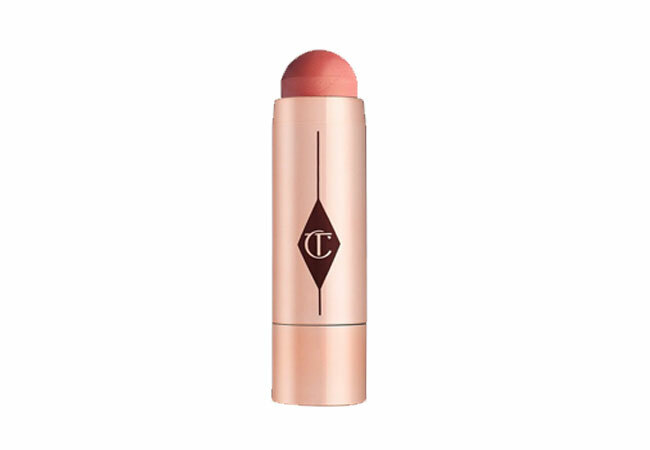 Go and cheat your way to a look of endless summer all year round with Charlotte Tilbury's Beach Sticks. The renown makeup artist turned beauty mogul has bottled your holiday summer glow--the happy, healthy, rested, youthful glow, that only a week at the beach can give you. The great thing about an outfit like this is that you can easily take it from day to night all while looking in "Full Bloom" no matter where you turn up.